UNITED NATIONS, June 26 -- As the UN Security Council's first month back in its historic home comes to a close, conditions to cover it could be quite a bit better, but threaten to get worse. 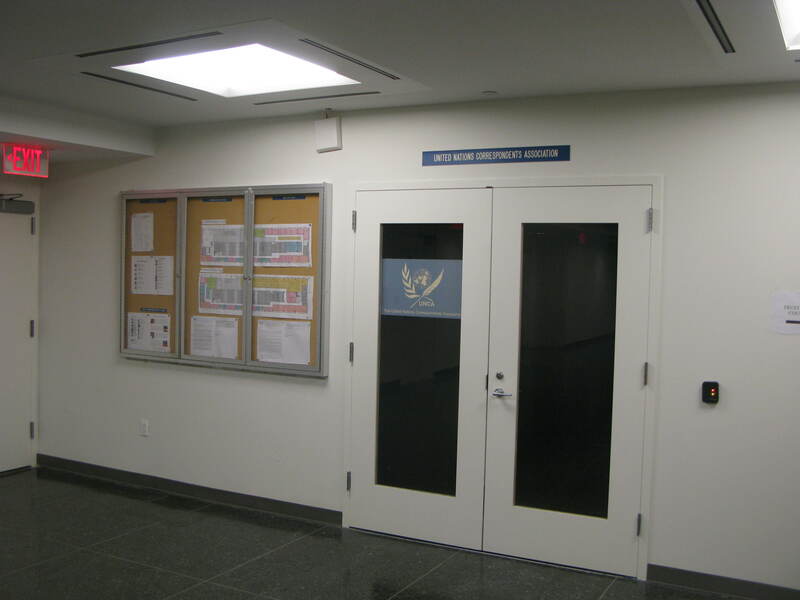 Despite there being a media worktable in front of the Council before and during the relocation, the Department of Public Information and its UN Censorship Alliance issued a rule saying there could be no “permanent workspace” there now. This has been implemented to mean, no table to type on. The Free UN Coalition for Access commented against the rule as soon as it saw a draft, on May 21. 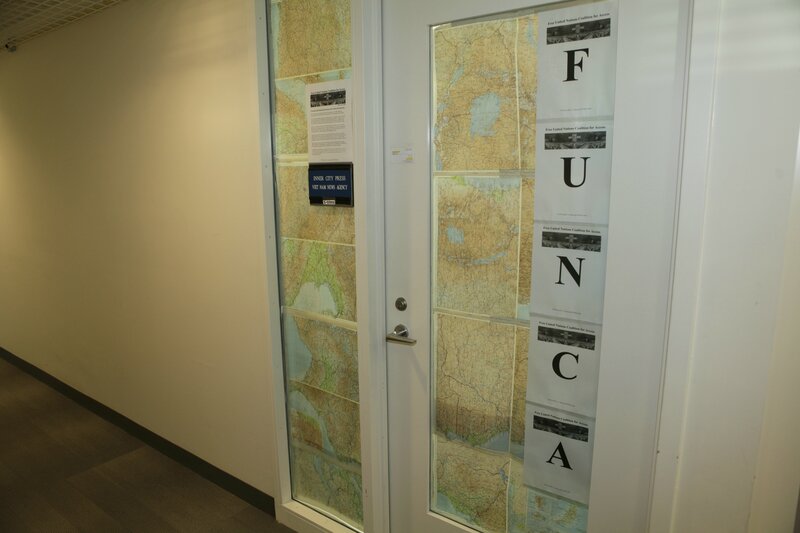 Based on FUNCA's comment, a proposal telling journalists not to be at the stakeout when there was not a formal Council meeting going on -- but during, say, bilateral meetings -- was dropped. But when Inner City Press brought a table to the stakeout, it was seized by DPI. Eventually, after FUNCA collected signatures on a petition, two small benches were installed. But they are too small, not allow for typing, and there are few to no electrical outlets even after a $2 billion renovation. On June 26 a journalist was told, for the first time, that they could not bring a guest they had signed in onto the second floor where the Security Council is. @FUNCA_info asked @UNMediaLiaison and its supervisor Stephane Dujarric why this was. Really? It was this office, MALU, which seized the table Inner City Press brought, and which passed on DPI's or Dujarric's threats to suspend or withdraw Inner City Press' accreditation for maintaining a single FUNCA sign on its office door, while UNCA has two signs, a big meeting room, a separate office and even a locked pantry it stores it wine glasses in. FUNCA replied to Dujarric asking who then the people who stop and take photographs of themselves at the stakeout microphone are? They have on white stickers, meaning they are guests. So some guests can come in, for tourism, but others can't, even for work? Dujarric did not answer. As noted @UNMediaLiaison did not reply at all, despite churning out notices all day. In fact, @UNMediaLiaison has replied to other more softball questions, including to UNCA's first vice president recently shown to have sent an internal UNCA document to Dujarric's private email address three minutes after it was produced. So UNCA spies for the UN, then gets its softball questions answered, while FUNCA which is advocating is not replied to, and is threatened with dis-accreditation? That's Ban's UN. Also typical of Ban's anti-labor UN, many of the TV broadcast and conferencing engineers are slated to lose their jobs on Friday. Meanwhile new contractor TeamPeople says it will hold trainings -- over the weekend -- for the fewer non-union workers replacing them as a skeleton crew. This would, of course, make it harder to cover the UN. But whose pressing for that? Watch this site. Footnote: at the June 26 noon briefing something similar happened -- Inner City Press pushed to get an additional question, then deferred when one of UNCA's Executive Committee members indicated they had one too. It was a softball - and then UN spokesperson Eduardo Del Buey said that it had replaced the question Inner City Press had pushed to asked. Duly noted.